I’ve visited the Mayan Riviera for over 10 years, and throughout the years, I’ve seen Playa del Carmen grow from a charming town into a bustling city lined with international fashion brands, restaurants and fun clubs. Love it or hate it, the town has changed, but has always offered many great shopping opportunities. 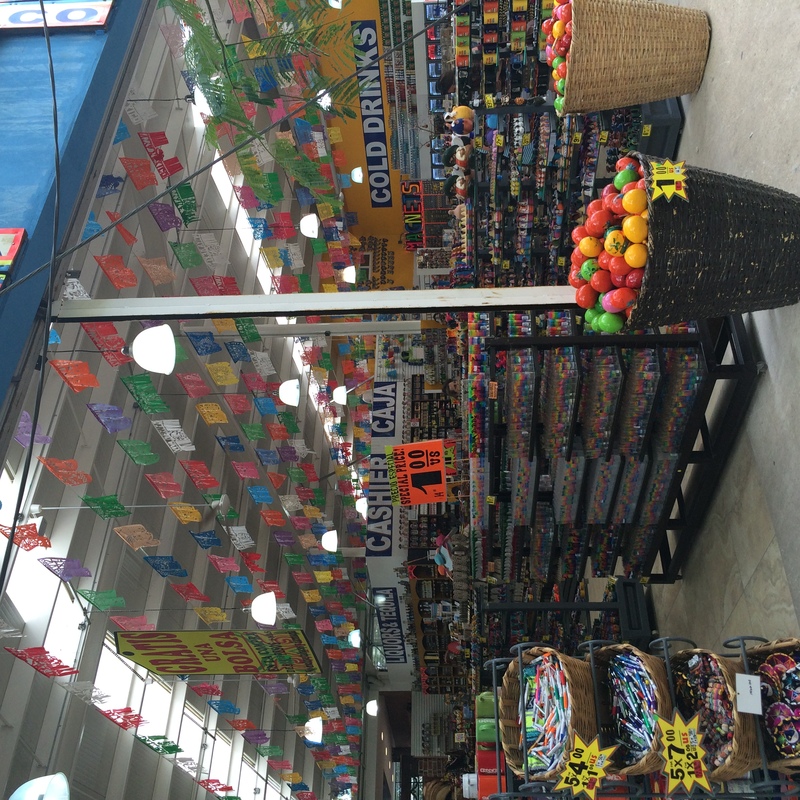 Here’s a little guide to shopping in Playa del Carmen, Mexico. If you’re looking for authentic Mexican crafts, ceramics and leather, there are many stores along Fifth Avenue. A lot of them, including Plaza la Fiesta have fixed prices if you don’t like bartering, and offer promotional deals on typical souvenirs as well. I prefer to go off into the side streets a couple blocks to look at leather bags and sandals. I picked up a beautiful leather bag when I went shopping in Playa del Carmen a couple years ago, and was able to negotiate a fair deal with the shop keeper. I fell in love with these gorgeous tapestries, and while I don’t have much space in my apartment, the table runners, placemats, and pillows would look amazing for a balcony patio with a kitschy Mexican feel. 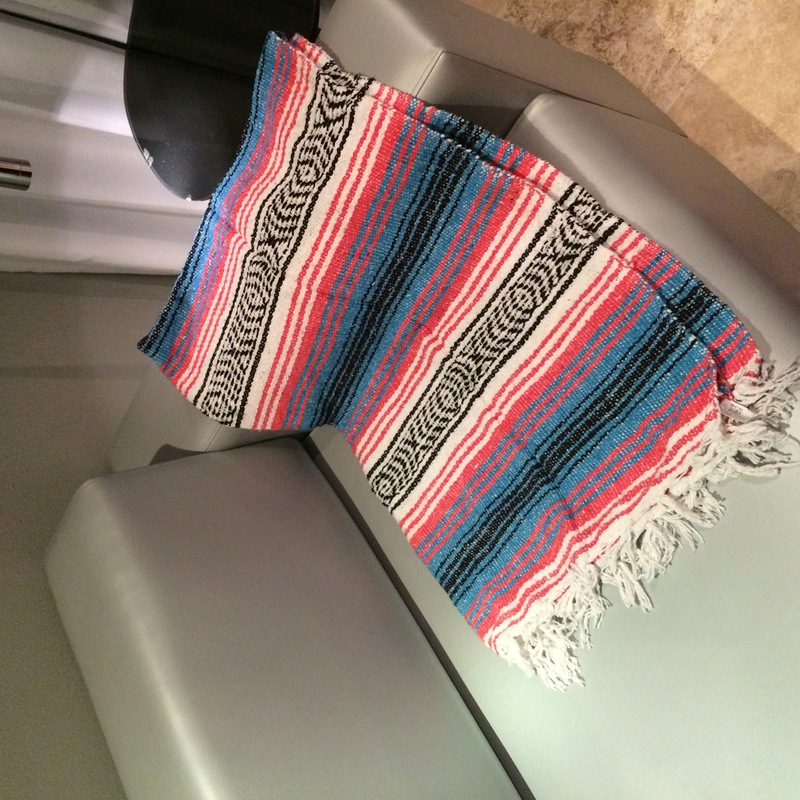 I ended up buying a woven blanket (Plaza La Fiesta only charged $7US! ), and a neat little porcelain skull that can be used as a tea light lantern ($10US). La Quinta Alegria was completed a couple years ago, and offers mall shopping in Playa del Carmen. With brands like Nike, Victoria’s Secret and Forever 21, you can pick up wardrobe essentials in case your luggage went missing! I didn’t go shopping here, because I can shop all of these stores at home. It kind of makes me sad to think of all the old silver and craft storefronts that were cleared for this. At the top of Fifth avenue is another outdoor mall. Great if you’re craving Krispy Kreme doughnuts, but a must-shop in this part is Plaza La Fiesta for Mexican souvenirs. Here, I’m outside the store front. I always make a point to stop by the beach, where I took some photos. I fell in love with the awesome seahorse motif on this fence, as well as the gorgeous cream and cobalt blue apartments that matched my dress. I’m wearing a white and blue embroidered dress c/o Chicwish, leather gladiator sandals from Athens, Urban Outfitters sunglasses, Coach crossbody bag and a St. Andrews Lady watch c/o Daniel Wellington. This dress was light and airy, yet comfortable for an afternoon shopping in Playa del Carmen. My leather gladiators are from Greece and are so practical, but I saw plenty of leather sandals at the market I was tempted by! The town also has some adorable restaurants (and even a tea shop), and a gorgeous square complete with performers and a stunning white church. I know that the next time I visit to go shopping in Playa del Carmen, there will be even more changes. I hope that development will stall a bit, to retain the authentic sellers. Otherwise, I will have to start shopping parallel to Fifth Avenue. I hope this guide to shopping in Playa del Carmen will help you hunt for souvenirs or to pick up some vacation wardrobe essentials. Happy shopping in paradise!